The heads of the US and UK government aid programs have recognised that efforts to reduce maternal mortality in Nepal offer potentially game changing lessons in the fight against international poverty. At a high-profile event on 21 September during the UN General Assembly in New York, Dr Rajiv Shah, Administrator of USAID, and Andrew Mitchell, UK Secretary of State for International Development, highlighted the innovative policies and programs to improve reproductive and maternal health in Nepal as bringing about a significant step toward achieving the UN’s Millennium Development Goals (MDGs).The event, MDG Countdown: Successes and Innovations, examined the successes and the potential for expansion in other countries. 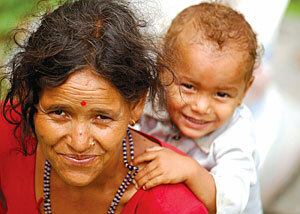 Nepal’s achievements stem from the constitutional recognition of health as citizens’ rights, scale-up of effective reproductive and maternal health services, and innovative policies to remove financial barriers to utilise them. Dr. Sudha Sharma, Secretary of Ministry of Health and Population (MOHP), presented Nepal’s case at the event.